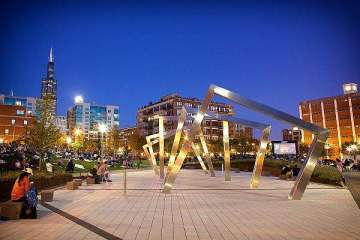 This once highly industrious hood is now well known for the hottest, award-winning restaurants, loft style living and center for art and fashion in Chicago. Before the 1871 Chicago Fire, Chicago was not always the fast growing hot-spot it is today. Once a prominent area with elegant streets, commercial development of warehouses and manufacturing plants turned the district into a scene for labor strikes and conflict. Since the turn of the century, the Near West Side has become very densely populated. The arrival of Cook County Hospital, University of Illinois’ new Chicago campus and development of light manufacturing industrial buildings into loft condos has turned the West Loop into one of the most popular and trendy neighborhoods to live in Chicago. Now a hub for art galleries, music venues, fashion, the Chicago Bulls and Blackhawks, the West Loop is not only a place tourists want to visit, but a neighborhood many want to call home.